﻿ A Smart Approach for Introducing Automation To Your Business. A Smart Approach for Introducing Automation To Your Business. Automation is the need of the time. Introducing business process automation to organizations is no more a luxury, rather a necessity. Surviving in today’s highly competitive market is not an easy task for companies and demand full utilization of available resources. So, how it’s being done? The industries are leveraging the power of technology. The enterprises are significantly increasing the speed, efficiency, and accuracy of their processes by incorporating technology into their functioning. The Redwood Software and Sapio Research have recently conducted a survey that says an approximately 59℅ of business processes will be automated by 2022. Doesn’t this statistic say it all? Deciding the best business automation services for your business is a must. Hiring a team to test and perform the needed technology gradually will help your company in the longer run. The clients and collaborators will also get enough time to adjust to the new technology. Thorough knowledge of the process you want to automate is necessary to give your company a technological push in the right direction. So, it’s better to take time and have a proper evaluation of the technology you want to implement in your business. A company is as good as its team. 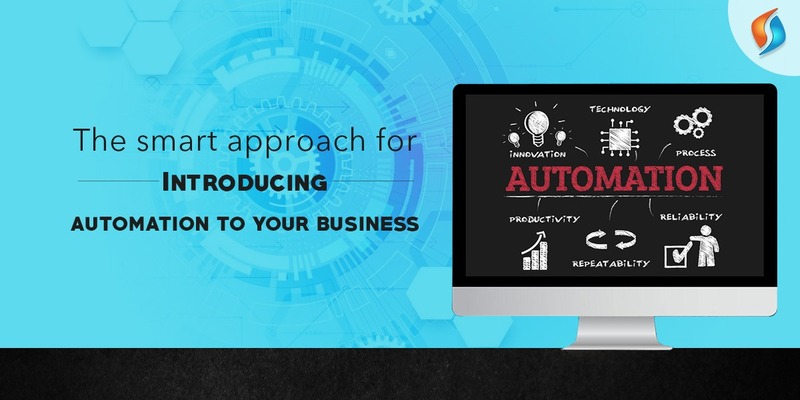 Introducing business process automation will change the functioning of your business, so you should help out your team in adapting to the new technology. Designing a training programme for the employees will help you out. Automating your business will disrupt the company’s services for a specified time. Previous plan of the process will help you out in implementing the new technology in a small frame of time. This will restore the normal functioning of the business process management as soon as possible. Estimating the time and cost involved in introducing business automation services to your business is a must, it will save significantly. So, you should automate only those processes that have the biggest ROI and saves you the most time. Long-term planning is the key to success for any industry. Before adopting business automation solutions to any process, you should keep in mind that the technology you are introducing doesn’t go obsolete shortly. It should be able to grow and adapt to the changing times. No technology is full proof, and there are always chances of some security lapse. So, regular monitoring of the business process automation processes is necessary to mitigate the risk quotient. Every technology suffers from the issues of bugs that hamper its normal functioning. A high degree of quality control of the deployed business process automation will ensure that the technology work as expected. Hire the best business process management consultants! As can be seen that business process automation holds immense potential to improve the efficiency and ability of businesses, the need is only its quick implementation. We at Signity Solutions have years of experience in providing automation consulting services to many industries. So, if you also wish to make your business smart and tech-savvy, our automation consulting services wing is at your service. Feel free to reach us, and we will revert at the earliest.